Feeling squeezed for space in your home? Upgrading your garage may be the solution. Whether you opt for a complete garage remodel or just a few small changes, you’ll be tapping into an extra 240-600 or so square feet. Here’s what you’ll need to plan for, to make your garage upgrade a usable and comfortable success. Job One in your garage upgrade is plumbing, a necessity if you are going to be working or relaxing in your new garage man cave, workshop, extra bedroom, or what have you for any length of time. You’ll definitely need a toilet, and a sink for cooking or wet bar facilities might be nice too. Do you already have a plumbing hookup in the garage for your washing machine? If so, you’re in luck. If you’ll be putting in a new water line, do it before you make any other upgrades, such as flooring. Most garages are floored with concrete, which is often in pretty rough shape. Clean the floor well, treating any oil stains with muriatic acid, and have a concrete specialist repair cracks and pitting. You might then simply paint and seal the surface once it is dry. When you are going to use the garage as a home office or living space, you’ll want something pleasanter beneath your feet, though. If the garage is earmarked as a workshop, pick an easy-to-clean material such as vinyl tile, which can be placed directly atop the sealed concrete. Otherwise, carpeting could the right choice, offering warmth and resilience; in this case, you’ll need to install a vapor barrier and a plywood subfloor. 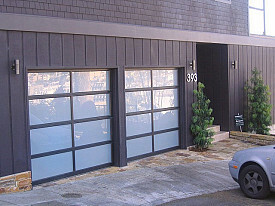 If you are due for a garage door replacement (typical door lifespan is approximately 30 years, unless it is damaged by severe weather or vehicular impact), choose a new design which either includes windows or is made primarily of glass.Accessorize with curtains or shades. You may be able to extend the heating and cooling ductwork from your home to tie in an attached garage. If this is not the case or if your garage is detached, you will need to decide on a method of HVAC. A ductless mini split air conditioner is convenient and efficient for the summer months. In cold weather, baseboard heaters will work well to heat the space. An electric fireplace is another possibility that will provide you with both heat and a cozy ambience. Another factor in keeping your garage upgrade at the right temperature is insulation. Apply insulation to the garage walls before drywall is to be hung. Calk any holes or gaps in the walls. The most important spot to insulate is your garage door, with the help of flexible batt, rigid polystyrene foam board, or reflective insulation boards or rolls. This is an easy DIY project – you will even find prepackaged insulation kits on the market. However, since insulation adds weight to the door, stay safe; have it checked -- and adjusted, if necessary -- by a garage door professional. Utilizing your garage to store extra possessions tends to be a dream come true when your house is short on space. Avoid turning it into a nightmare of disorganized, impossible-to-find stuff. A little forethought will enable you to choose a storage system that will work right for your needs. Think built-in cabinets and shelves, pegboards, and even ceiling-mounted storage.